Kaunas International Airport is the second busiest airport in Lithuania. Gateway to city of Kaunas, this international airport supports a large number of international and domestic flights including Air Baltic, Ryanair, SprintAir and more. Passenger facilities supported by this international Lithuanian airport include bank, auto exchange machine, bureau de change, post office, VIP lounge, cafes, bars, restaurants, gift shops, help desk, parent/baby room, duty free shops, disabled facilities and car rental. Kaunas is a beautiful city with stunning architecture and outstanding landmarks. Sightseeing in Kaunas consists of Kaunas Castle, St. Francis Xavier Church; Kaunas Cathedral Basilica, Napoleon's Hill; House of Perkūnas; Kaunas Synagogue; Kaunas Synagogue; Lithuanian Aviation Museum; Kaunas State Puppet Theatre and more. Festivals and events to be explored in this Lithuanian city include Bike show millennium (takes place in June), international open air jazz festival (between April and May), Kaunas photo festival (between September and October) and many more. Travelers in Kaunas can rejuvenate and relax at its beautiful beaches including Panemunes Park Beach, Lampedžiai Lake Beach and Kaunas Reservoir Beach. Food lovers can enjoy exotic Lithuanian dishes or can even visit their favorite international fast food centers like McDonald and KFC. Kaunas is a city with surprising balance of traditional and contemporary culture. Lithuania Cars Rental is one of the most trusted car rental firms with excellent deals and features to offers. With a wide spread network of leading car rental suppliers in Lithuania, we make sure that you get the best car rental deal at every location in Lithuania with added benefits. Liability insurance, collision damage waiver, protection from theft, roadside assistance and a friendly customer support are few reasons to choose Lithuania cars rental. 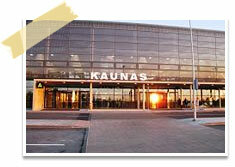 The variety of locations covered by Lithuania Cars Rental also includes Kaunas airport and city.